Read the truth about painted, coated and laminated OSB used in lieu of noncombustible materials in our article: Roof Deck Fact Check. 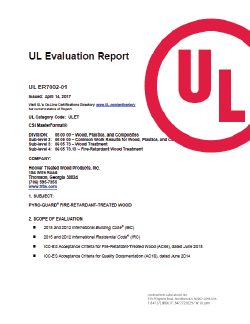 Hoover now offers fire retardant or preservative treatment for laminated veneer lumber (LVL) and Scaffold Plank . Contact Sales via email (Sales@frtw.com) or phone (1.800.531.5558) for more information. Hoover Treated Wood Products, Inc supplies a comprehensive portfolio of pressure-impregnated kiln-dried lumber and plywood products for fire retardant and preservative applications. Contact Sales via email (Sales@frtw.com) or phone (1.800.531.5558) for more information. The building codes have a growing list of applications for fire retardant treated wood in building construction of almost all types. Read more about Non-Combustible Application for Wood? Read about how the IBC recognizes FRTW for many applications where noncombustible materials are required in Type I & II Construction.